This great small Toyota campervan for sale in Sydney is the perfect vehicle for trip around Australia! If you are here in Sydney, then visit our used campervans for sale shop close to Sydney airport. You can test drive and see what stock we have left for sale. Therefore call Shaun on 0421 10 10 21 or email [email protected] for our latest vehicles for sale. 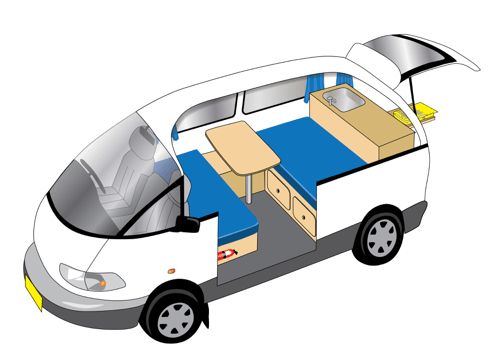 When you buy a small Toyota used campervan for sale from us it comes fully furnished. These ex-rental small campervans for hire are perfect for a couple or 2 friends. For example they are easy to drive, no crazy colours or massive marketing slogans or stickers all over the campervan! These are especially suited to those that want to travel in style around Australia on a budget. Here is a link to our page about the Travelwheels 2 person automatic campervan for hire. First of all we hire out these campervans all over Australia. As a result of buying newer vehicles, we then sell them off to customers looking to buy a used ex-rental campervan in Australia. Here is a useful link to our page about cheap Sydney campervan hire. Another useful page is our guide to the cheapest time of year to hire a campervan in Australia. This small Toyota campervan for sale has been designed and build by travelwheels campervan sales here in Sydney. It has under bench storage spaces, and a nice sized double bed. It comes with a great mini kitchen with a proper two burner gas cooker and a 2kg gas bottle. These are way cheaper and easier to use that those expensive throw away gas canisters! Small Toyota campervan for sale with fridge or icebox – you choose! This Toyota used campervan for sale comes with a cool box for a fridge. 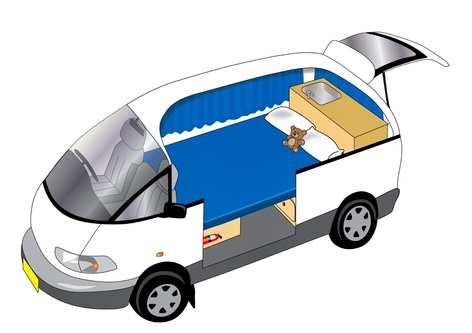 This for example is a way we can reduce the price of the campervan. Therefore if you are looking to buy a used campervan with a fridge, we have other options especially available for you. The guys from Travelwheels used campervan sales will help you to find the right used campervan for sale. Here at our office in Sydney or via email or phone (0421101021) we are here to help. For example we can offer plenty of free advice about any topic relating to campervans in Australia. When you buy a used campervan from travelwheels campervans our team will help with legal documents. Our team for example will make sure you have third party insurance, and all the registration documents. Basically everything you especially need do have all the necessary legal paperwork required here in Australia. Why buy small Toyota campervan for sale from travelwheels? Contact travelwheels campervans office here in Sydney. Therefore if you need more information, we can help you. Our small Toyota campervan for sale are a very popular choice. Feel free to email us at [email protected]. Why not call our friendly sales team (we speak Deutsch and Français) on 0421101021 in Australia. You can also visit our sister site and check the stock at buying campervans Sydney.